An online controversy spread to the halls of city government in Anchorage on Tuesday, with accusations flying about fake news, liberal media bias and a militant Islamic training camp in Wasilla that does not exist. The Anchorage Assembly’s Tuesday night meeting was unusually dramatic as a Big Lake couple stepped up to the microphone to demand an apology from Assembly member Amy Demboski. “We’re here in response to the negative propaganda that Amy Demboski has been spewing on her radio show and Facebook,” said Greg Jones, standing beside his wife Maleika. According to Jones, he was implicated last Friday when Demboski posted an article on the Facebook page for her radio show headlined “Islamic compounds across the U.S. Stockpiling Arms.” Though the Facebook post never mentioned him by name, the materials it linked to offer enough clues to quickly figure out Jones was the one referenced. A map of the United States was shown, with areas highlighted where such compounds are purported to be. The map includes Alaska. Jones’ wife, Maleika, testified that the post received comments online that have made the family feel threatened. “I need to know why this was done, and I need assurance that you all are going to help me stay safe in Anchorage, Alaska,” she finished. The remarks were met with a long standing ovation from the packed audience. The Joneses asked for an apology. But Demboski said she does not owe them one, maintaining she simply raised the question of whether a violent group might be present in Alaska. The couple got a very different response from Assembly Chair Elvi Gray-Jackson, who said she couldn’t apologize for her colleague. “But I apologize as the chair of this Assembly for your inconvenience, and for the fear you are now living in, and it brings tears to my eyes,” Gray-Jackson said, choking up as applause broke out in the crowd. In the days leading up to this exchange, accusations ricocheted around the small world of Anchorage politics and media. Demboski addressed the charges Monday during her call-in show on the radio station KVNT. She said she was filling a gap left by local media. “My point was, this was a failure of the Alaska media. And the failure is: when we’re getting national media like this, we want you to either validate it or disprove it,” Demboski said. The “national media” attention Demboski referenced was a segment on Fox Business. In it, host Stuart Varney was joined by guest Ryan Mauro of the Clarion Project, who claimed that Islamic compounds across the country are stockpiling weapons. Mauro drew attention to an organization called Muslims of America, which some conservative commentators say is associated with an extremist group called Jamaat ul-Fuqra. The problem is, when you look at the Fuqra files for Alaska, evidence that there’s a threat is, at best, unfounded, and at worst reckless conspiracy theories and fear-mongering. A spokesperson for the FBI said there’s no evidence of anything like an Islamic compound or violent extremist cell in Alaska. As a religious group, Muslims of America is unconventional, and concerns have been raised in the past by the Anti-Defamation League about anti-Semitic and homophobic views expressed by members, including an overseas cleric. But there are no legal cases or national security investigations substantiating violent threats made by the group. 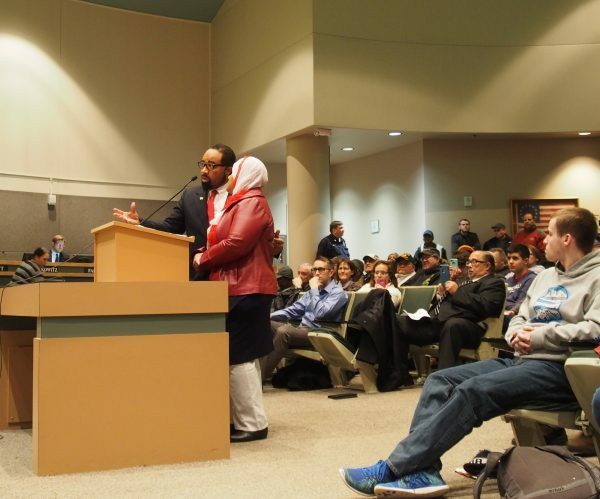 Gregory and Maleika Jones are members of Muslims of America and active participants in interfaith activities in the Anchorage area. The Clarion Project based its Alaska claims on a Muslims of America newsletter from 2009 that highlighted the Jones’ move to the state. In the Fox Business segment, Mauro told Varney that Muslims of America is preparing for violent confrontations across the country, but provided spurious and vague evidence. “It does not appear that in most cases the FBI is sharing information at the local level,” Mauro said, explaining why local police departments aren’t intervening. When Demboski interviewed Jones on her show during his candidacy for a state house seat this fall, a caller brought up Jones’s history with Muslims of America. Demoboski said what ensued was a polite discussion. In an interview Monday, she said her recent remarks have been blown out of proportion. During her Wednesday radio show, Demboski doubled down. She spent a portion of her show faulting the media for misconstruing her intent to “ask the tough questions.” Along with a guest, she discussed at length an FBI report from a 2002 incident that’s been cited by the Clarion Project. But that incident has not resulted in legal action or sanction against Muslims of America. Not everyone who testified at Tuesday’s Assembly meeting agreed with Demboski’s interpretation of her actions. “While you did not call Mr. Jones a terrorist, you provided the links for people to read that ultimately led to an article that associated Mr. Jones with a terrorist organization. Whether it was or not, there is no proof,” Mike Wachsmuth said. Wachsmuth was one of the last people to address Demboski before the meeting adjourned. For his part, Greg Jones said he and his family hope to stay involved in the community, participating in interfaith dialogue, and helping people learn more about Islam.